Fourteen people, including young boy scouts, were killed at St. Finbarr’s Parish Church in Makurdi, Benue State on March 17th, 2012. Five of those killed were boy scouts who had volunteered to direct cars entering the church grounds. Also killed was an adult adviser to the boys and other adults near the main gate. 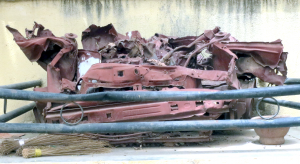 Car the suicide bomber drove on the grounds of the church as a reminder. At the service I attended, the Easter homily offered by the priest centered on the sacrifice and Resurrection of our Lord, and was very appropriate to the losses at the church. Remarkably, the church has grown in membership since the suicide bombing. The car the suicide bomber drove — or, rather, what is left of it — sits on the grounds of the church as an awkward kind of reminder of the tragedy. In speaking with the church officials, my Nigerian ministry partner, and I recommended that the victims be memorialized with something permanent. Temporary cardboard memorials placed on anniversary dates had not lasted and were gone. We requested of the priest, Father Peter Zakka, that we meet with the families of the victims to discuss a memorial that our organizations would finance. We also requested that family members bring pictures of those they lost to the meeting for us to give to an artist. Early Monday morning we met with the relatives of all fourteen victims including parents of the boys who died; wives and husbands of those lost; and children of those martyred. I spoke briefly to the assembled group about the forces that are encroaching on a once thriving church in Nigeria and told them of the similarities to the persecuted church in the Middle East. I promised the families that we would do something to memorialize the martyrs of the church. In a closing prayer, I assured them of the message that we receive in the Word of God of everlasting life through the resurrected Christ. When I am on mission trips, I visit the services of all denominations, whether Catholic, Orthodox, Protestant or Evangelical. All of them are equally attacked and persecuted by Islamic terrorist organizations such as the Boko Haram.